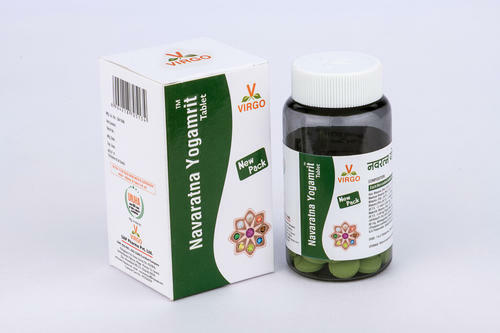 Navratna Yogamrit Tablet is for Muscular, Physical and mental weakness. It is rich source of natural minerals. Provides major as well as trace minerals & nutrients. Enhances immunity, longevity and vitality. Provides physical and mental support Prevents and treats bone diseases. Virgo UAP Pharma Pvt Ltd brings you to the products of Ayurvedic formulations and proprietary Ayurvedic medicines that are time-tested. Our prime focus is on providing value to quality products, be it Ayurvedic formulations or Ayurvedic medicines. These products are patented, treating diverse health ailments. Virgo UAP Pharma Pvt. Ltd., an GMP Ayurvedic Medicines Manufacturing Company in India, was started in a tradition going back more than hundred years when Vaidraj Nagindas Chhaganlal Shah used to actually dig deep into forests and scale mountains at odd hours, and in various seasons as indicated by the Shastras to search personally for berries, seeds, leaves and dig roots etc. for formulating Ayurvedic panacea in the service of humanity. Ayurveda or the centuries-old "Science of Life" is based on the simple idea of treating the individual rather than the disease. This principle indicates gleaning and sourcing materials from the same Nature of which mankind is a crucial part, aiming for a holistic saturation of therapy and nutritious ingredients towards systemic absorption.